A man has been cutting down trees in Oregon State University’s McDonald-Dunn Research Forest to build a cabin-type structure. The research out of Oregon State University and the U.S. Forest Service examined long-term data on bird species that use different forest types, like old growth and less mature, open-canopy areas referred to as “early seral” forests. According to a study published by Oregon State University (OSU), super-eruptions are among the most devastating cataclysm known to man. 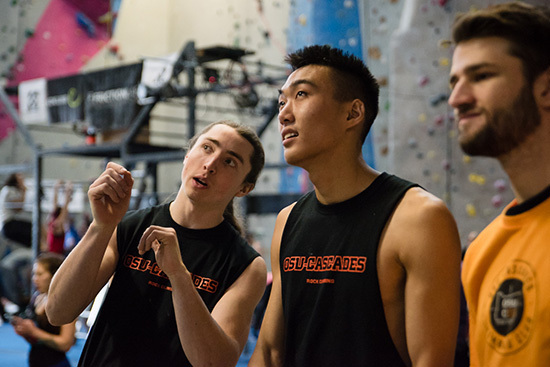 Rocking It A year ago OSU-Cascades junior and business major Connor Park (center) started a student rock climbing club with four students. Less than a year later, it’s the largest student club by far. Ten percent of OSU-Cascades’ students are members. The competitive team that spawned from it competed in its first event, the Bend Boulder Bash on Feb. 1. Connor placed fourth and his fellow club leader Gabe McFarlane (left) placed first in the advanced level. Not bad for year one. Rock on. Department Only Surplus Sale: Surplus Property will host a sale of furniture and lab equipment to OSU departments only on Thursday, Feb. 7, 9 a.m. to 3 p.m., at 4575 SW Research Way. Merchandise photos, more sale details and contact info here. Soup, Bread and Sweets: Thursday, Feb. 7, 11 a.m. to 1 p.m. in 326 Bexell Hall. For questions contact donita.godwin@oregonstate.edu. This event is part of the OSU Food Drive. Chili Competition & Baked Potato Bar Lunch: Come by Cordley 3029 on Feb. 7, 11:30 a.m. to 1:30 p.m. for chili and baked potatoes brought to you by School of Life Sciences. Vote for your favorite chili. Potato & toppings $3; Chili & voting ballot $3; both for $5. For questions, contact durrellt@science.oregonstate.edu. This event is part of the OSU Food Drive. NROTC Thursday Soup Day: Join us each Thursday in the Naval Armory Quarterdeck for delicious soups, desserts and beverages. All monies raised are donated to OSU's 2019 Food Drive. Each week you will have five soups ($4/$7), two desserts ($1) and beverages ($1) to choose from. It comes with a free piece of bread. Feb. 7, 11:30 a.m. to 1 p.m. For more information contact lauri.morris@oregonstate.edu. This event is part of the OSU Food Drive. NEW! Race in America Series: Session one of this three-part discussion series centered on themes raised by Colson Whitehead’s Pulitzer Prize winning novel, "The Underground Railroad," is today from 6 to 7:30 p.m. at the Lonnie B. Harris Black Cultural Center, Gathering Hall. NEW! Behind the Scenes Recycling Tour: Want to know what happens to recyclables after they hit the bin? Get a behind the scenes look on Tuesday, Feb. 12, 3:30 to 4:30 p.m., on the south side of campus. Learn more and register in advance here, or contact Andrea Norris for questions at 541-737-5398 or andrea.norris@oregonstate.edu. NEW! MIME Distinguished Speaker - From Energy Access to Grid Resiliency: A Story of Anthropology, Engineering, and Business: Nathan Johnson, assistant professor at the Ira A. Fulton Schools of Engineering at Arizona State University and director of the Laboratory for Energy And Power Solutions (LEAPS), will discuss opportunities for innovation with global impact by beginning with methods that capture and interpret user insights before diving deeper into four synergistic project areas that each connect user insights with technical research to the delivered product. Friday, Feb. 8, 4 p.m., Rogers Hall, 226. NEW! Walter Hamady and the Extravagance of Letterpress: Walter Hamady is a publisher, artist and poet celebrated for his inventive approach to bookmaking and the printed arts. In this talk, Karen Holmberg, who teaches creative writing in the School of Writing, Literature, and Film, will discuss how Hamady engages extravagance — visual, material, and temporal — to explore and press meaning from each convention of book and page. Monday Feb. 11, 4 p.m., Autzen House, 811 SW Jefferson Ave.
NEW! Science Pub: Benjamin Dalziel, an assistant professor in Oregon State University’s College of Science, will discuss his research on how the flu virus is transmitted at the Corvallis Science Pub on Monday, Feb. 11. The presentation will start at 6 p.m. at the Old World Deli, 341 2nd St. in Corvallis. It is free and open to the public. Due to the continuing popularity of Science Pub, attendance will be limited and advance registration will be required. Registration is at https://bit.ly/2W9hfRE or by calling University Events at 541-737-4717. People who arrive without a ticket are welcome but will not be admitted to the reserved seating area until 6 p.m.
Budget conversation: On Friday, Feb. 8, at noon the Office of Budget & Fiscal Planning will hold another University Budget Conversation in the Memorial Union 208. This week’s topic is about the FY19 budget reductions and FY20 outlook. The budget conversations sessions are limited to 60 minutes and are an open forum structure with the initial 15-20 minutes spent on presentation of the topic, leaving time for discussion and Q&A. We encourage you to bring your lunch and join the conversation and to learn more about OSU’s budgeting and fiscal matters. A budget brief (handout) will be available on Friday. More information about University Budget Conversations can be found on the Office of Budget & Fiscal Planning website. If you have questions, contact Sherm Bloomer for more information. For details on attending the meeting via conference call contact Kayla Campbell. Soup lunch: Join us at noon Feb. 8 in ALS 3006 for hot soup to warm your soul. Crop and Soil Science Soup Lunch. Come by and enjoy some hot soup. $5 suggested donation. For more information contact emmalie.goodwin@oregonstate.edu. Panda Express Night Supporting HC Food Drive Looking to eat some delicious orange chicken AND donate to the Linn-Benton Canned Food Drive? If you stop by the Panda Express in the MU on Feb. 8 between 4-9 p.m., pick up some dinner, and mention the fundraiser to the cashier, you can do both: 100 percent of the earnings from this fundraiser (20 percent of sales) will go straight to Linn-Benton Food Share. “You know, some people say life is short and that you could get hit by a bus at any moment and that you have to live each day like it's your last. BS. Life is long. You're probably not gonna get hit by a bus. And you're gonna have to live with the choices you make for the next fifty years.” ~ Chris Rock, who turns 54 today. Corvallis: Mostly cloudy with a slight chance of rain, high of 43, low of 31. Chance of snow Thursday night, and rain and snow possible Friday. Central Oregon: Mostly sunny, high of 35, low of 20. Chance of snow Friday. Newport: Slight chance of rain and snow Thursday, high of 45, low of 34. Chance of rain Friday.